In preparation for the upcoming Legends in the Fall, I am running an Ambush Valley scenario of my own devising this Sunday. The scenario will feature two squads of US infantry attempting to sweep and clear a village that has been known to harbor both Local and Main Force Viet Cong elements. The US players will have to be careful not to alienate the local civilians while they search for weapon caches, tunnel entrances and signs of the elusive VC. Game time as always is 1 PM at Unique Gifts and Games in Grayslake, IL. Both Ambush Valley and Tomorrow’s War have been released, and quite honestly, I need to run something other than Tomorrow’s War for a change of pace. You can purchase both through Ken at Unique Gifts and Games, or you can buy the PDF directly from us at http://ambushalleygames.com/products/store. 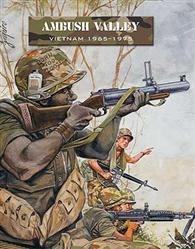 I have to say that Ambush Valley is about the most comprehensive sourcebook for Vietnam that I have ever seen. Piers and Joe have outdone themselves on this one. I am hoping to have my 15mm Vietnam figures mostly painted by Sunday, but we’ll see. If not, I’ll borrow some of Skip’s 20mm FAA figures for the game. I am using a mix of Flames of War and Flashpoint figures, with buildings by TimeCast. For tunnel markers, I am using some of Khurasan’s mine shaft entrances (with some green stuff/modifications). Hope to see all of you on Sunday.